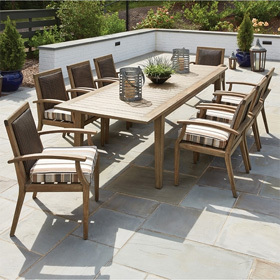 The outdoor furniture industry's best all-American manufacturers now offer accessory pillows that coordinate with their outdoor lounge seating and outdoor dining seating. These outdoor pillows are designed to bring superior comfort to patio furniture arrangements. Options include throw pillows, head pillows, neck pillows, kidney pillows and more. Accessory pillows come in a variety of shapes and sizes, and are offered with classic designs as well as eye-catching emblem styles. The pillows are made utilizing fabrics that perform impressively outdoors and are easy to clean. Most pillows are available with custom order options for fabric color/pattern. Cord and fringe accents are also available for select styles.